Going on a road trip with your dog makes for a great summer vacation, but it will take some planning to ensure everyone makes it back home in one piece. Summer means it's time for fun, sun, and best of all, road trips! Pack your bags, stock up on snacks, update your GPS, and you're ready to roll. There's just one thing you're forgetting...your dog! A road trip is a great opportunity to take your furry best friend on vacation with you, but a cross-country adventure is a whole new experience compared to a quick trip to the dog park. Here are four tips to make going on a road trip with your dog enjoyable for both you and your four-legged co-pilot. Before you start your own packing, make sure your pooch has everything she needs depending on where you're going and how long you'll be gone. Pack extra food, and you'll need a storage container big enough to fit it all. If you don't have a car crate or safety harness, consider investing in one for this long trip. Safety should always be a top concern, and you don't want your pooch flying forward every time you slam on the brakes. 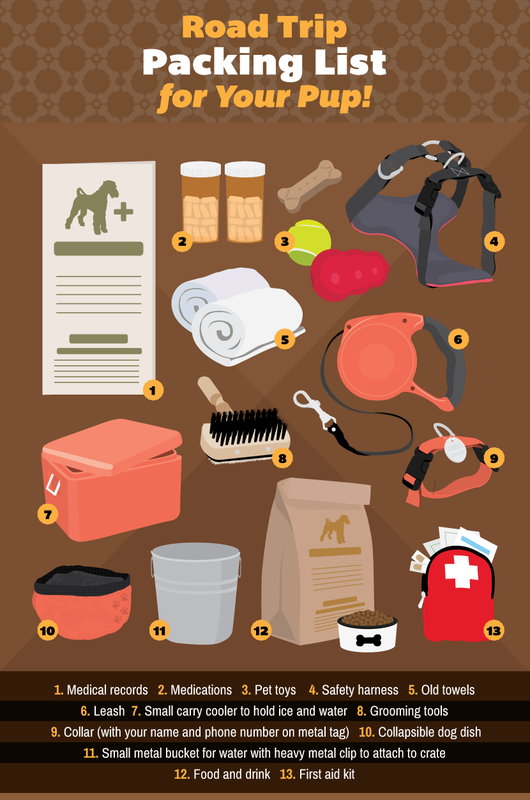 You'll also need a doggy first aid kit, blankets and pillows that smell like home, a few toys, and a lot of poop bags (a lot). Spontaneity is great, but when you're road-tripping with your dog, it may get you in trouble. Whether you plan on staying at hotels or ruffing it at a campground, you'll need to find pet-friendly accommodations. Use the Yelp app to find places to stay along your route, and research nearby vets, just in case. Your pooch will also appreciate you knowing where the nearest dog park is. If you have a pit bull, you need to be aware that some areas have breed restriction laws that prohibit your square-faced friend from even entering the town. You don't agree with their prejudice, but you do want to avoid a run-in with the law. When it's just you and your human best friend, you can cram your suitcases in any which way you want as long as your basic essentials like snacks and phone are close at hand. When you have to accommodate a four-legged passenger, however, things get trickier. Your dog needs a "safe zone" where she can sleep and relax. Try putting the back seats down and configuring suitcases to create a cozy backseat nook. But make sure the suitcases are secure and won't shift during the drive.While you're at it, make sure all your dog's essential items, like toys, food, and water, aren't buried with the rest of your stuff. You and your pooch may be world-class bladder holding champions, but that doesn't mean you should drive past every rest stop. You'll both benefit from a break, and you'll need to give your dog a chance to work out some of her energy. A hyperactive dog tearing up your backseat while you're doing 80 on the highway is the last thing you need. Go for a brisk walk at every bathroom stop, and remember, a tired dog is a well-behaved dog. There's nothing better than exploring the country with your best friend by your side. Now that you've taken the time to prepare, it's time to grab your pup and start your engine! Do you go on road trips with your dog? Tell us how you prepare in the comments below. WATCH NOW: Doggie Water Fountain Looks Like Too Much Fun!